I’ve been enjoying pumpkin smoothies, pumpkin oats, pumpkin fudge, pumpkin muffins, pumpkin spice latte bars, pumpkin overnight oats…anything I can put pumpkin, I’m doing it! I don’t know about you guys, but I’ve been drooling over all the pumpkin recipes popping up in my Pinterest feed so I thought I’d round up the best vegan pumpkin recipes so we all eat more pumpkin! These delicious recipes really stood out to me and are definitely on my must-make list this fall! This list of the best vegan pumpkin recipes covers everything from pumpkin cheesecake to raw pumpkin pie, pumpkin oat cookies, pumpkin waffles and more. 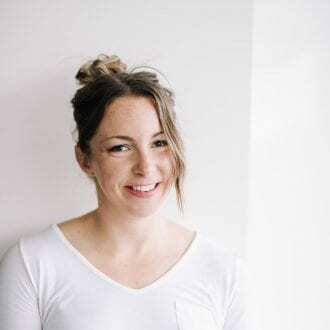 I’ve organized the list by various recipe types and while it’s mostly desserts and sweets, you’ll even find a few savoury pumpkin recipes such as pumpkin soup and vegan pumpkin curry. 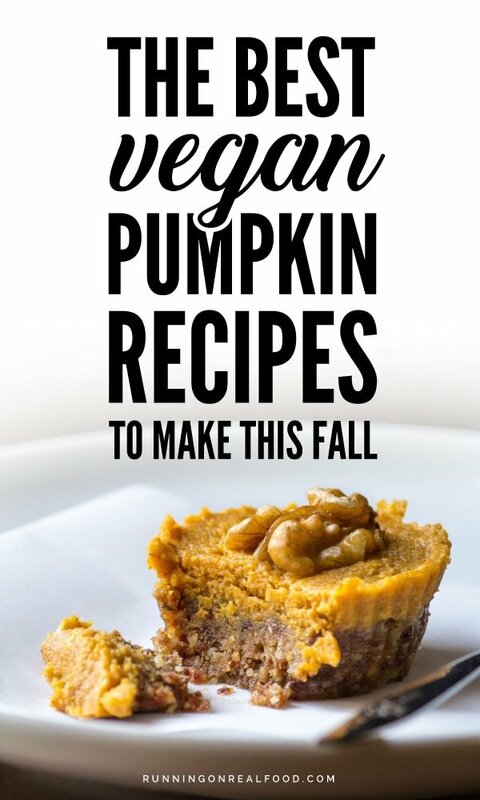 Basically it covers every single pumpkin recipe you will ever need. Happy pumpkin eating! Oh and I have all of these plus a ton more saved to my Vegan Pumpkin Recipes Pinterest board. Check it out! These vegan pumpkin pie recipes range from baked pumpkin pie to raw recipes and pumpkin pie squares. These are fairly easy to make. You’ll need some vegan graham crackers to keep them vegan or you could use regular ones if you’re okay with honey. The filling is made from pumpkin puree, maple syrup, cane sugar and coconut cream so they’re definitely on the decadent side but if you’re looking for something special, these would be a great choice. If you need a traditional pumpkin pie made vegan and gluten-free. I’d check out this beauty from Jessica in the Kitchen. She’s got lots of notes, tips and tricks for pumpkin pie success so if you make this for Thanksgiving you should be good to go! 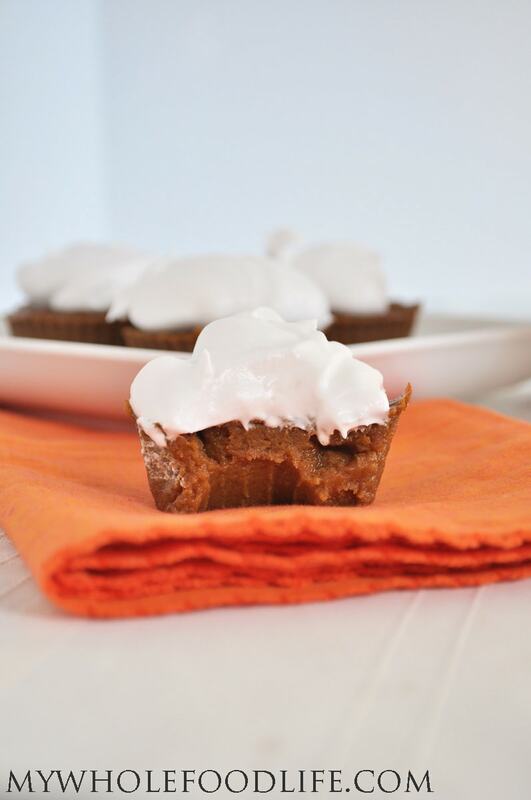 These simple pumpkin pie cups are so easy to make! All you need is almond flour, maple syrup, pumpkin pie spice, pumpkin and sweet potato! Healthy pumpkin pie, hello! We’re talking pumpkin, coconut nut milk, oats, flax, coconut sugar and spices. So easy plus gluten-free, oil-free and refined sugar-free. This recipe from Chocolate Covered Katie is popular and well-reviewed. 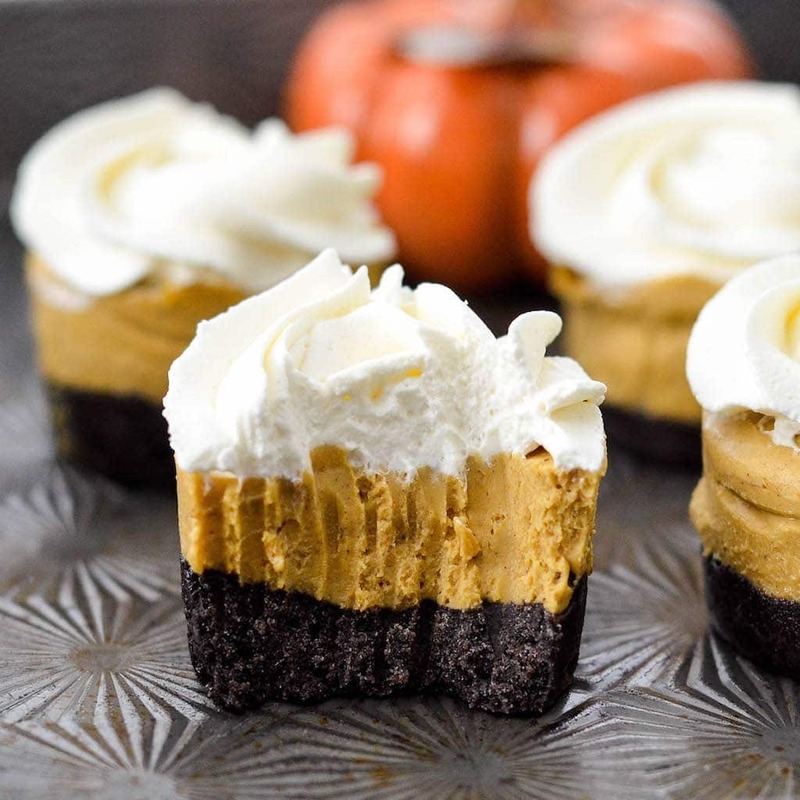 These no-bake mini vegan pumpkin pies feature an Oreo crust and a cashew-based pie. Make these for a fun way to finish your Thanksgiving feast. This recipe is gluten-free and refined sugar-free. These mini no-bake pumpkin tarts are easy to make with an walnut coconut crust and date and pumpkin filling. This recipe is gluten-free and refined sugar-free. 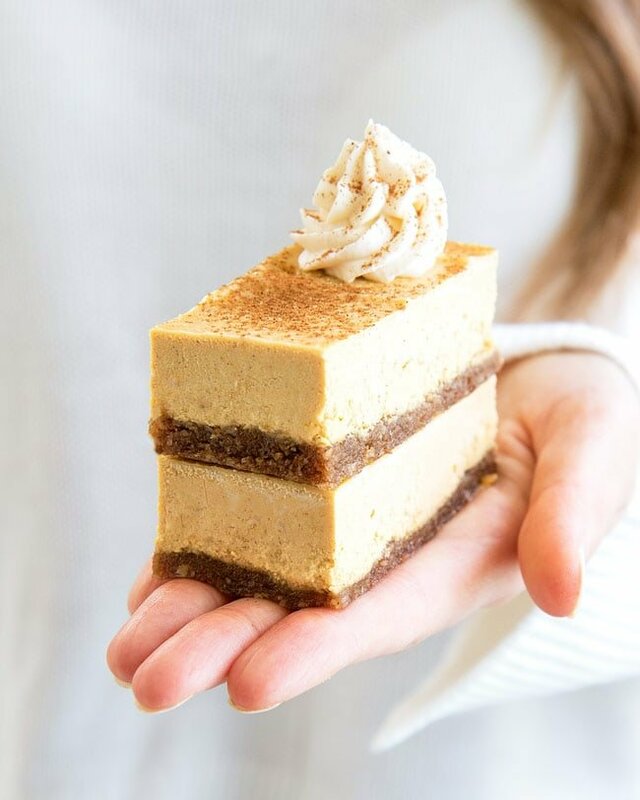 These beautiful pumpkin pie cream squares from Simply Raw involve a pecan, almond, date and coconut crust, creamy nut-free filling and cashew frosting. These ones take a bit of work but are definitely worth it. Bonus: make some extra cashew coconut frosting and use it with some of the other pumpkin treats on this list. This recipe is no-bake and gluten-free. These no-bake pumpkin pie tarts are made with simple crust of walnuts and dates and topped with a creamy coconut pumpkin layer made from coconut butter, pumpkin, spices and maple syrup. If you don’t feel like baking, this raw pumpkin pie tart is perfect for a decadent but wholesome treat. These paleo pumpkin cupcakes are made from pumpkin, banana, coconut sugar and pumpkin pie spices. The whipping cream is made from coconut milk and pure maple syrup. You’ll need 5 minutes to prep them and 25 minutes of baking time. These are a good choice if you need a grain-free dessert that will work for everyone. 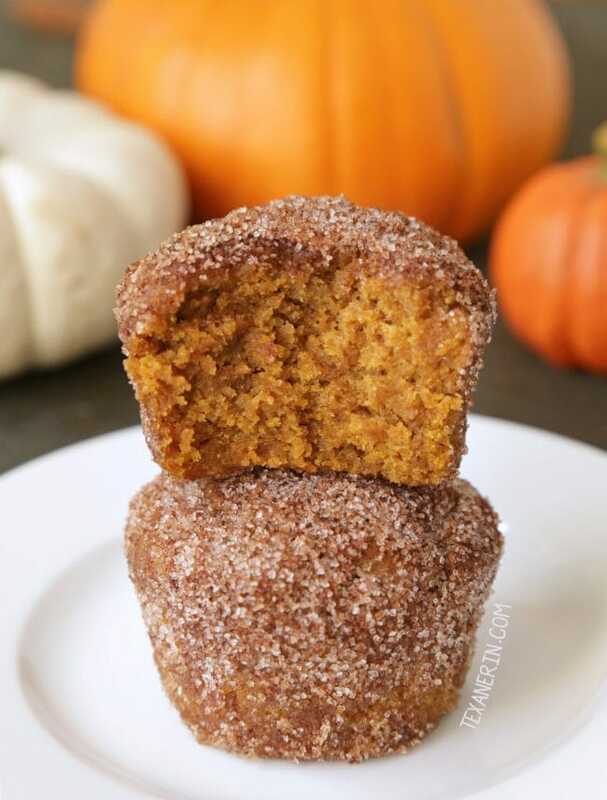 These vegan pumpkin muffins from Texanerin are gluten-free or with spelt or whole wheat flour. They’re also sweetened with maple syrup. This recipe has a ton of 5-star reviews so you can’t go wrong. They’re soft, fluffy and delicious! 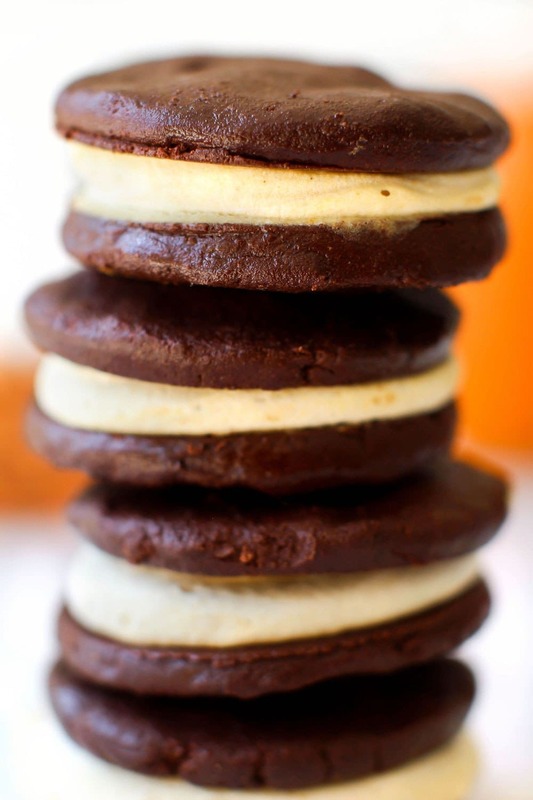 These pumpkin spice Oreo’s look fancy but they’re super easy to make with just a few simple ingredients. This recipe is gluten-free, oil-free and refined sugar-free/low in sugar. 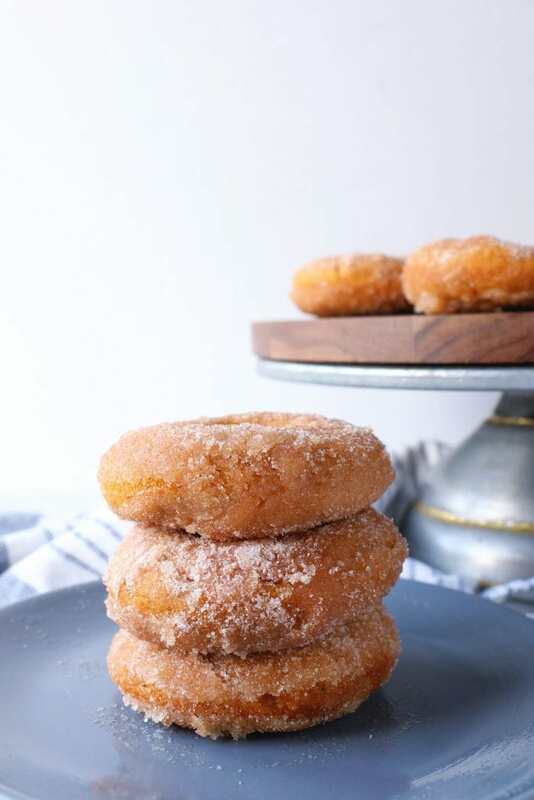 These gluten-free cinnamon sugar pumpkin donuts are easy to make with a simple list of ingredients. 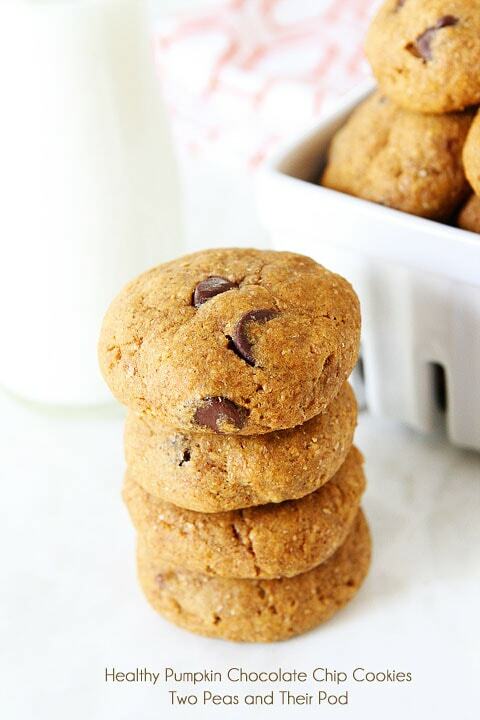 These cookies are made with whole wheat flour, spices, brown sugar, coconut oil and pumpkin puree. These little cookies are too cute! 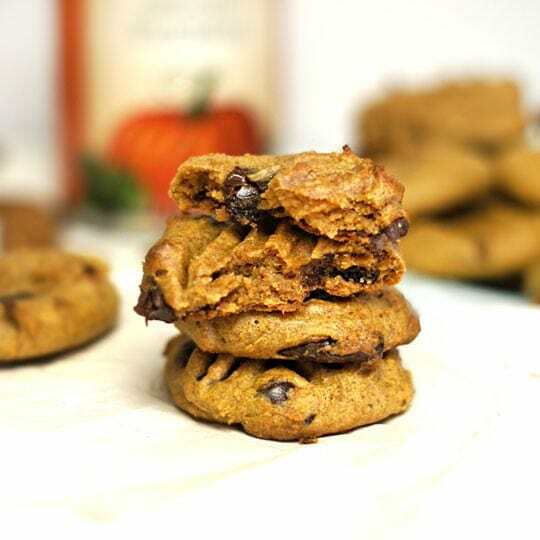 They’re made with whole rolled oats, pumpkin and chocolate chips for a tasty Fall treat. If you feel like getting your baking fix on, these are a great option from this list. I’d say it’s a safe bet that kids would love these too. These simple cookies are very healthy and make a great snack, quick breakfast and yummy dessert. I love them heated up and topped with a little almond butter. 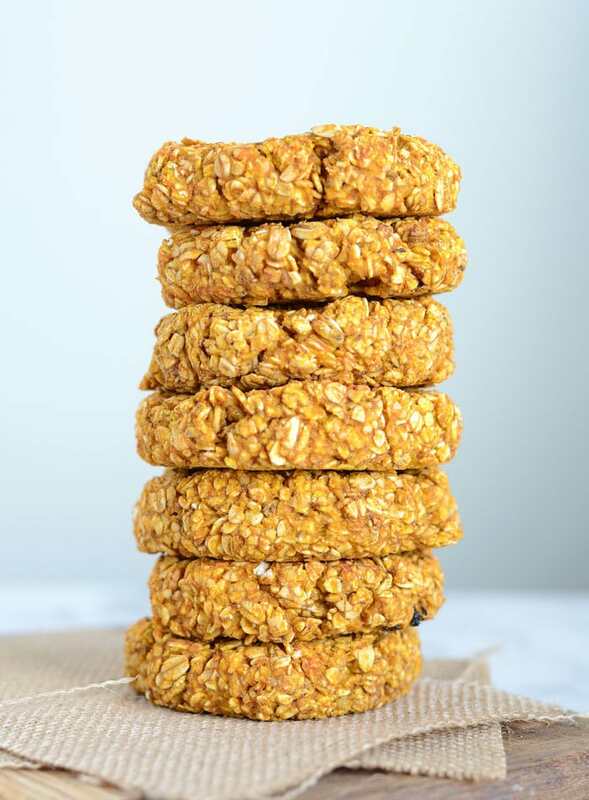 You only need two ingredients to make these gluten-free oat cookies. These ones are not a decadent cookie but rather a healthy, slightly-sweet treat you can enjoy for some natural energy. These pumpkin spice cheesecake bars by Choosing Chia are made with a simple date and pecan crust and have a cashew-based pumpkin filling. The recipe raw, vegan, gluten-free and refined sugar-free. 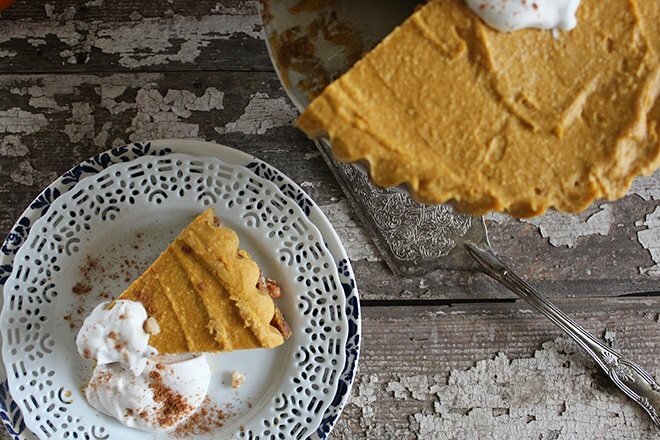 This vegan pumpkin pie cheesecake from Damy Health is gluten-free, no-bake and high in fibre. 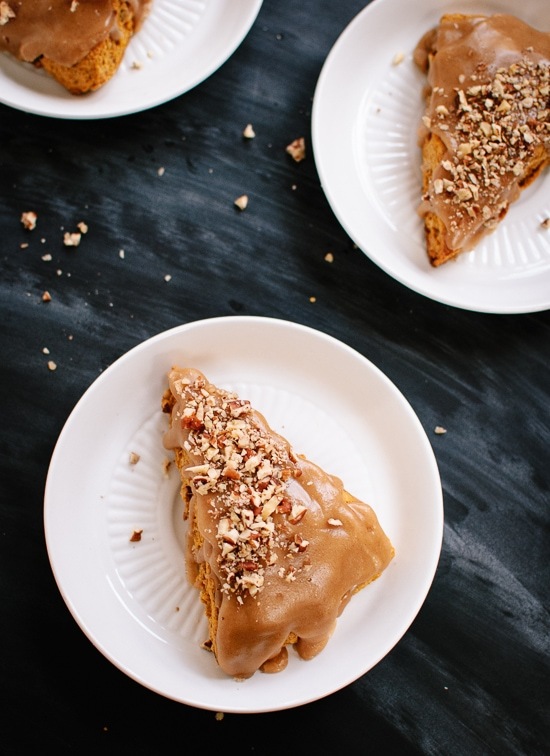 You’ll need pumpkin, cashew butter and some other everyday pantry ingredients for the filling and coconut, pecans and dates for the crust. I’m totally stashing one of these in the freezer so I’m ready for my next pumpkin fix. These mini-cheesecakes are so dang cute. 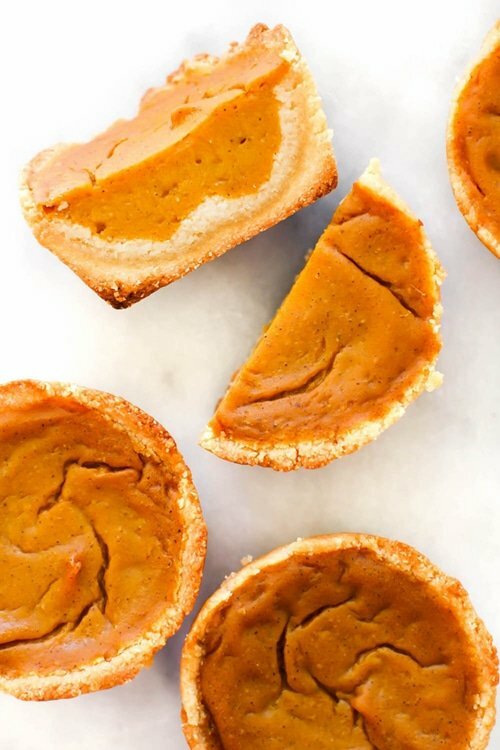 They’re gluten-free and no-bake and you’ll need pecans, dates and coconut oil for the crust and pumpkin, cashews, coconut oil and maple syrup for the filling. Can’t decide on pumpkin or gingerbread. Well, no problem, have both! These two classic Fall flavours are combined in this pumpkin gingerbread smoothie and topped with an optional simple, raw cookie dough for a special added treat. Love pumpkin spice lattes but not all the sugar they come along with? 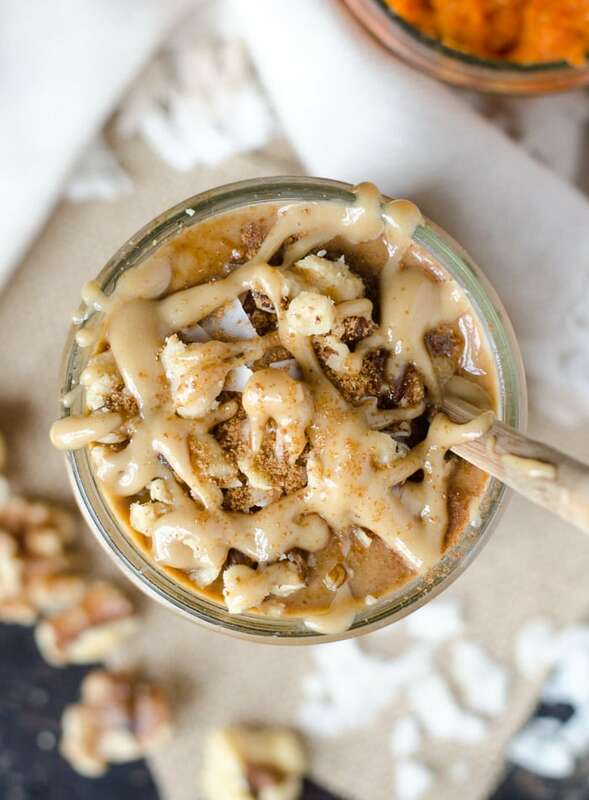 How about a delicious, high-protein vegan pumpkin spice latte smoothie instead? This smoothie is made with coffee, banana, almond milk, protein and pumpkin. Try it topped with the optional caramel date drizzle. Skip the expensive and sugar-laden coffee shop pumpkin spice latte and make your own with coffee, pumpkin, non-dairy milk, pumpkin pie spice and pure maple syrup. You must try this beautiful, soft and fluffy vegan pumpkin cake from Feasting on Fruit. Made with oat and almond flour and sweetened naturally with coconut sugar. 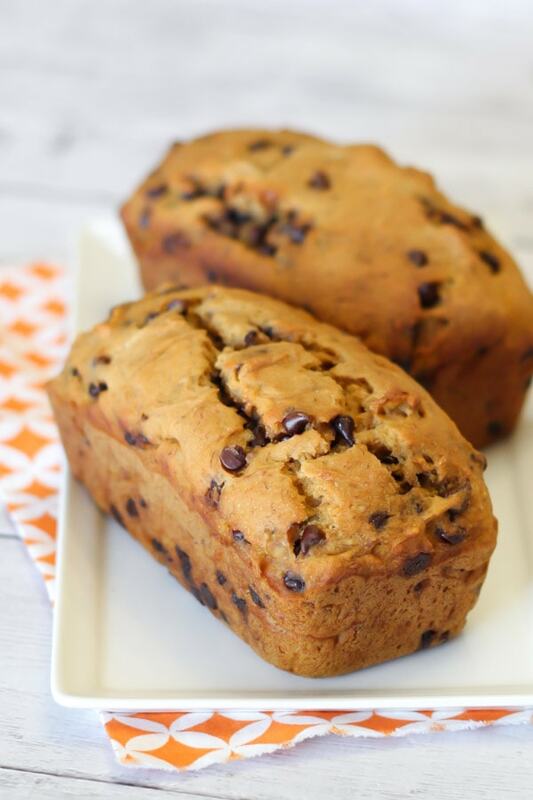 This beautiful chocolate chip pumpkin loaf is made with gluten-free flour, bananas, pumpkin and coconut sugar for a vegan, gluten-free and refined sugar-free loaf that is perfect for Fall mornings alongside a cup of coffee. 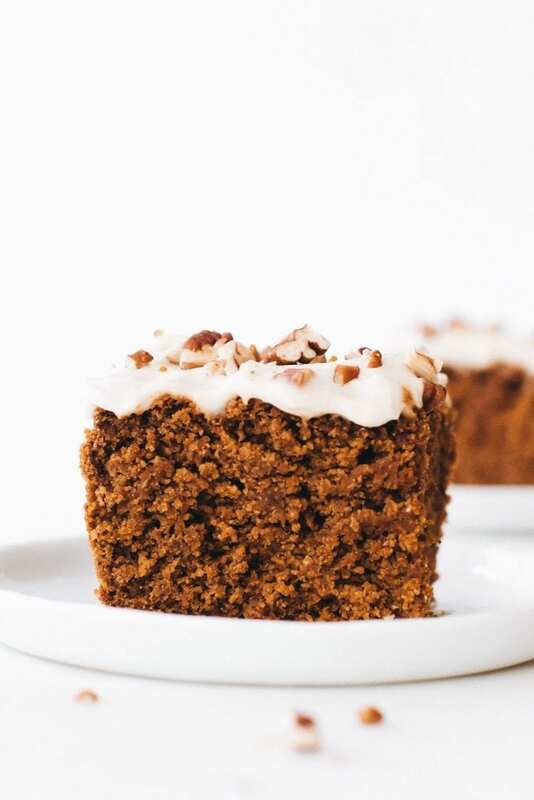 This vegan pumpkin bread is studded with sweet, soft bites of dates. 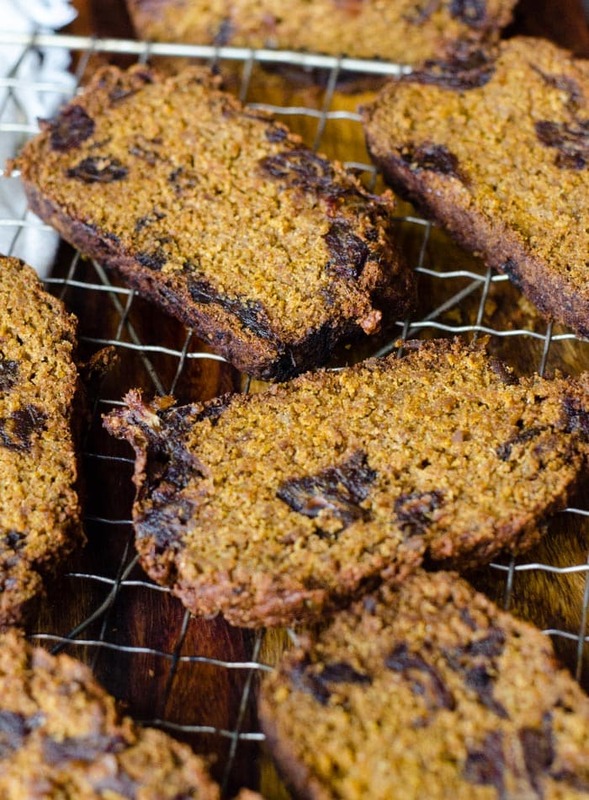 This recipe is made with coconut sugar and spelt flour and uses psyllium for binding. This pumpkin loaf recipe is made with spelt flour, coconut sugar, coconut oil and pumpkin puree. Its’ a simple recipe based on a banana loaf using canned pumpkin in place of the banana for a warm and cozy Fall take on banana bread. If you need a special pumpkin cake, the one from Holy Cow Vegan might be the way to go. The recipe has lots of raving reviews as to how good it is. This one is not gluten-free nor oil-free so it may not be for everyone but it would be a lovely way to finish off a Thanksgiving feast. We’ve gotta have a couple of good pumpkin bread recipes on this list, don’t you think? We’ll kick things off with this cozy pumpkin currant bread from Minimalist Baker. It’s healthy, dense, moist and packed with Fall flavour. Try it with a cup of tea for a delicious afternoon treat or as part of a Fall brunch with friends or family. 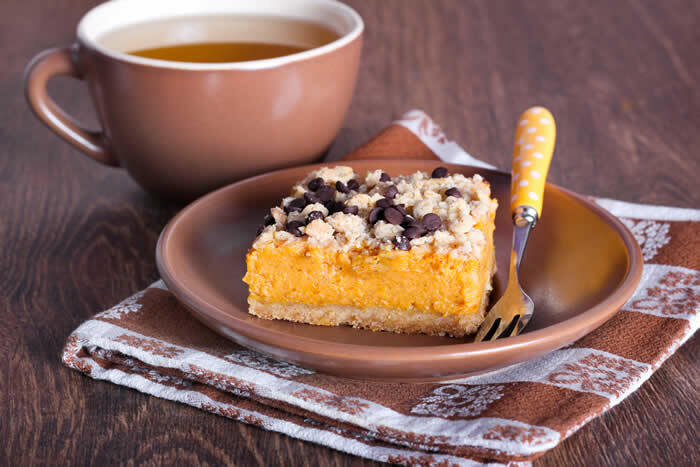 These gluten-free pumpkin bars are similar to some of the other pumpkin bar recipes on this list but have added chai spice for a fun flavour twist. The crust is made from oats, coconut, dates and pumpkin seeds and the filling is made from pumpkin, maple syrup, coconut oil, coconut flour and chai spices. 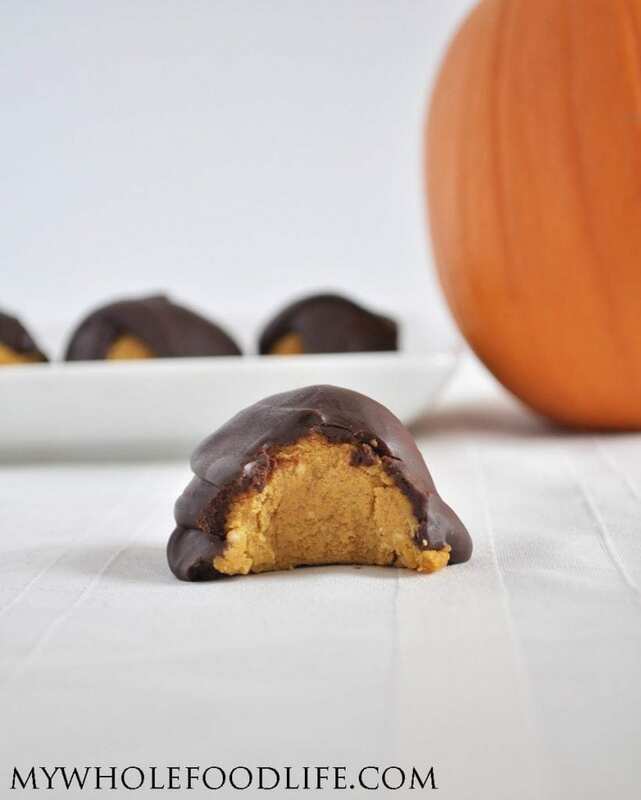 These pumpkin pie truffles are made with almond flour, pumpkin, maple syrup and coconut oil making them grain-free and paleo. No baking required and easy to make in about 30 minutes. 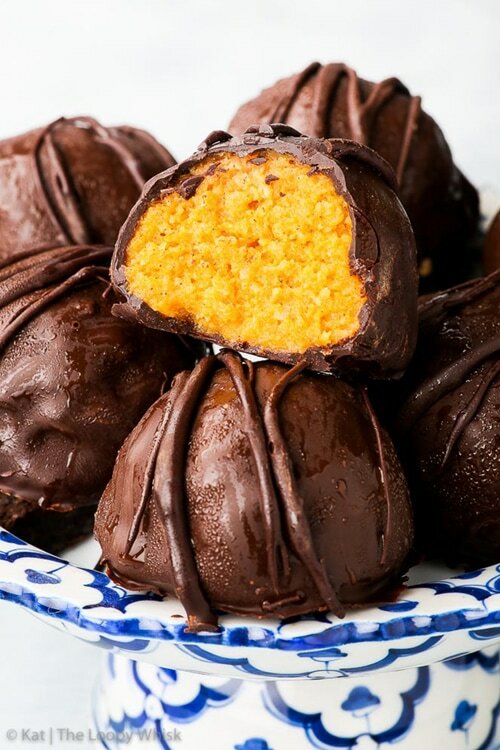 These delicious pumpkin truffles call for just 5 ingredients plus chocolate chips for the coating. You’ll need pumpkin, coconut butter, maple syrup, cinnamon and nutmeg to make the truffles and chocolate chips and almond milk for the chocolate coating. They’re simple to make with no-bake required and the perfect size for a daily pumpkin treat. This category covers recipes on the healthier side such as homemade energy bars, energy bites and protein bars. 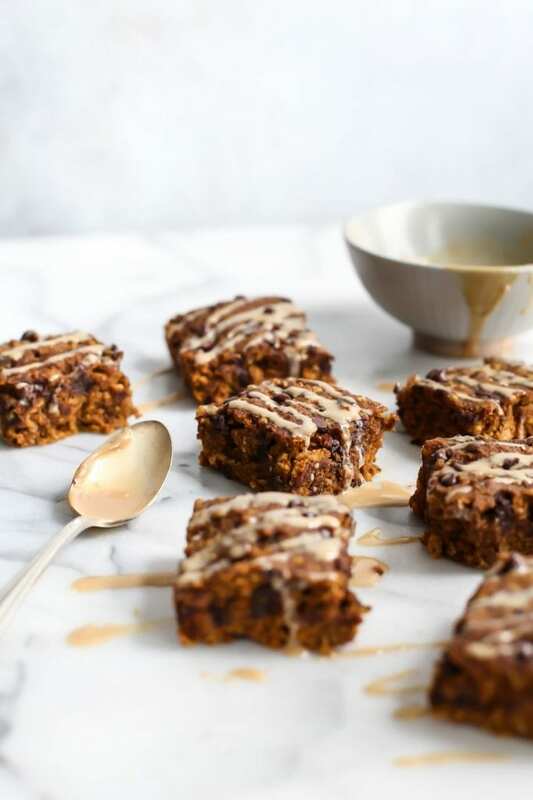 If you love pumpkin spice lattes then these energy bars made with almonds, dates, coconut, coffee, protein and pumpkin are right up your alley. These bars are no-bake, gluten-free and taste like your favourite Fall drink in energy bar form. For pumpkin breakfast recipes we’ll cover scones, waffles, pancakes, baked oatmeal, granola, baked oatmeal bars and French toast. Of course, I would never judge you for eating anything on this list for breakfast! 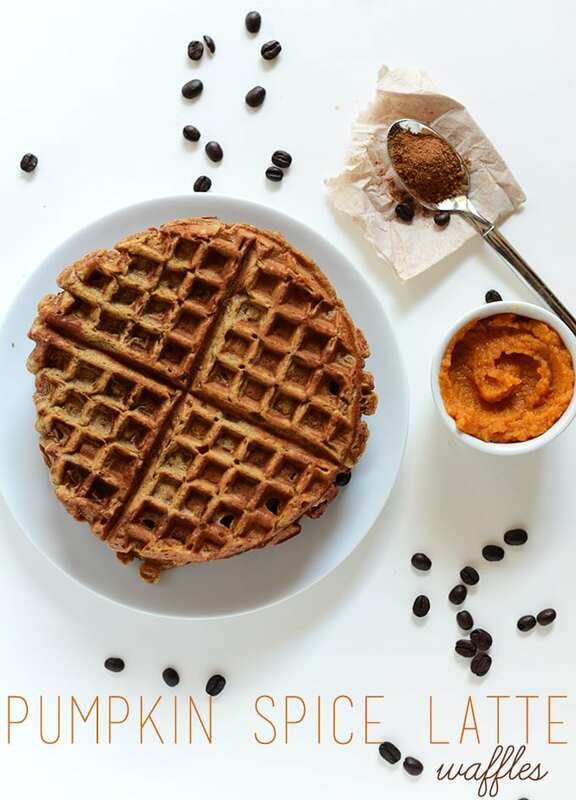 Every list of vegan pumpkin recipes needs at least one pumpkin waffle on it. I went with these Minimalist Baker Pumpkin Spice Latte Waffles because who doesn’t want to start the day with this much deliciousness? These are very easy to make and can be made with spelt or whole wheat pastry flour. Let’s follow up those pumpkin waffles with pumpkin french toast. This amazing pumpkin french toast from Edible Perspective is really easy to make with just a few simple ingredients such as flax, spices and pumpkin puree. This would be a perfect Thanksgiving-morning breakfast. Holy, that’s a mouthful! Haha, a delicious mouthful though! 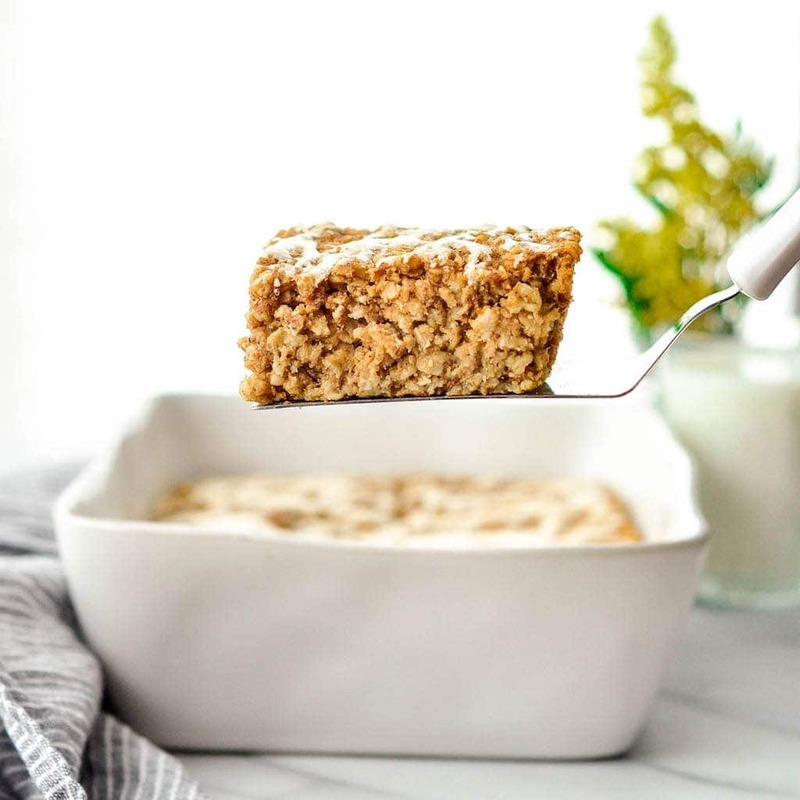 These baked oatmeal pumpkin oatmeal bars from Fit Mitten Kitchen are made with oats, a gluten-free flour blend, pure maple syrup, pumpki puree and dairy-free chocolate chips. These would be perfect for a weekend brunch. Easy, pumpkin baked oatmeal you can enjoy for breakfast all week! Gluten-free, oil-free, refined sugar-free and simple to make with wholesome ingredients. To make it vegan, simply omit the cream cheese glaze or use a vegan cream cheese to make it. This chia pudding features a layer of chia pudding topping with pumpkin mousse. They’re easy to make with some simple ingredients such as chia seeds, coconut milk, cashews, maple syrup and pumpkin puree. These would make stunning dessert to finish off a Fall meal with friends. This stovetop pumpkin pie steel cut oatmeal has added pumpkin, apple sauce and nuts. Try it with the optional pumpkin cream made from pumpkin and soy milk. This simple pumpkin pie chia pudding is just waiting to be layered in a bowl with crumbled pumpkin oat or ginger cookies. 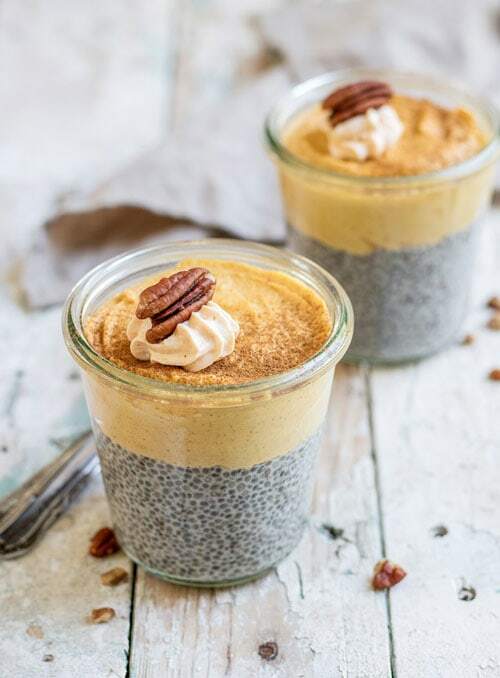 The chia pudding is easy to make with almond milk, protein, chia seeds and pumpkin and can be enjoyed on it’s own or layered to make a chia pudding parfait. Two of the best things ever together at last: pumpkin spice lattes and granola! This vegan granola is made with coffee, dates, pumpkin, coconut and almond. So good! You can’t beat overnight oats for an easy way to get your daily pumpkin fix. Prep these pumpkin spice overnight oats to wake up to a healthy version of pumpkin pie you can enjoy all Fall and Winter long. This pumpkin spice almond butter fudge is dangerous. It’s too easy to make and too easy to eat if you ask me. You be the judge. You’ll need almond butter, coconut oil, pumpkin, pure maple syrup and spices to make it. Try it with the optional chocolate drizzle to really take it up a notch. 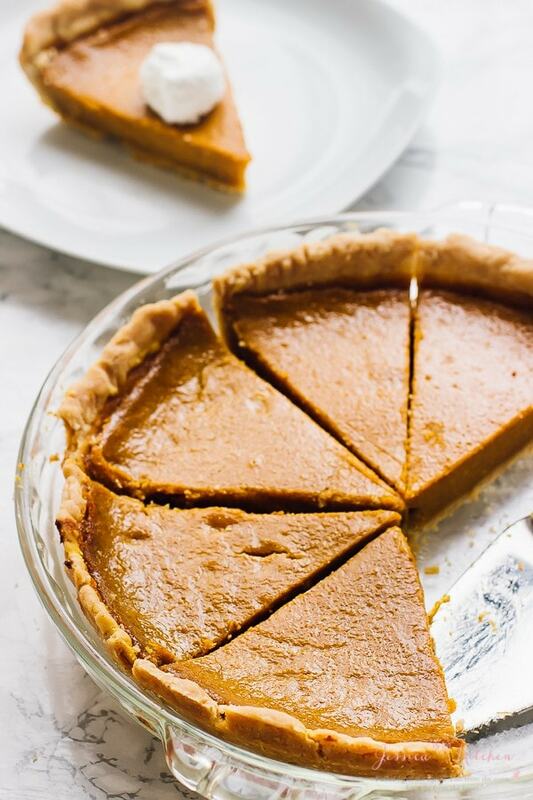 This no-bake vegan pumpkin pie is made with just coconut butter, pumpkin and pure maple syrup. Simple, delicious and perfect for stashing in the freezer for when you need a little slice of pumpkin heaven. 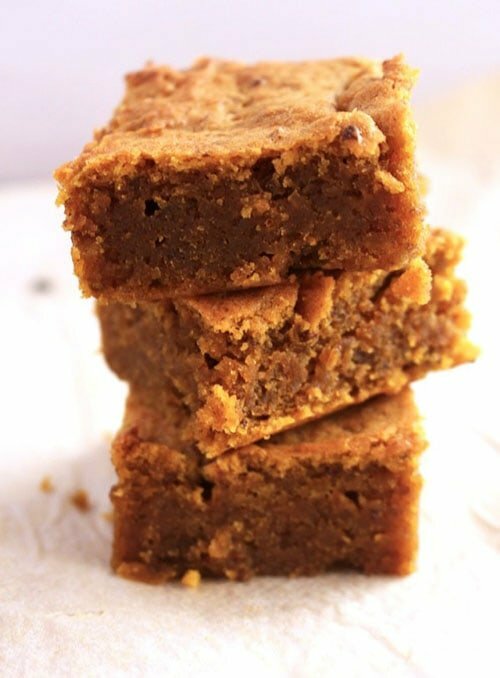 This 5-ingredient vegan pumpkin pie fudge is a must-make this Fall. It’s so easy and the texture and flavour is incredible. Enjoy a slice straight from the freezer, it’s so good! Need a quick and healthy pumpkin dessert? This pudding is the way to go! It’s made from tofu, pure maple syrup and canned pumpkin. With just 5 simple ingredients, it’s a great one to have in your back pocket for your next pumpkin craving. You only need 4 ingredients plus cinnamon to make these!! Amazing, right? 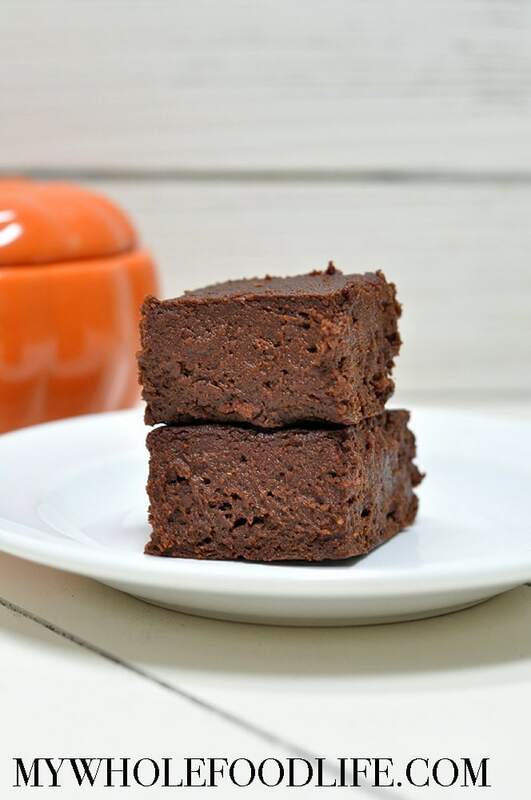 Gather up some pumkin, almond butter, coconut sugar and cacao powder and whip up these super easy chocolate pumpkin brownies. These vegan pumpkin creme brule is surprisingly easy to make. You will need a torch to finish them off so they’re a little on the fancy side but if you’re hosting Thanksgiving and want to impress, these will do the trick. The creme is made from cashews, pumpkin and non-dairy milk. These are definitely a decadent treat but I like how simple the recipe was. They’re not gluten-free or oil-free but you’ll only need a handful of simple ingredients and they have great reviews. All you need to make this amazing pumpkin whipped cream is coconut milk, pumpkin, stevia and pumpkin pie spice. Use this on maple pecan pie, pumpkin smoothies, pumpkin spice lattes and anything else you can think of. It’s easy to make and sure to impress if you add it to your holiday dessert spread. While pumpkin is most often used in sweet recipes I had to include some delicious savoury pumpkin recipes too. Pumpkin works beautifully in dishes like soups and curries. 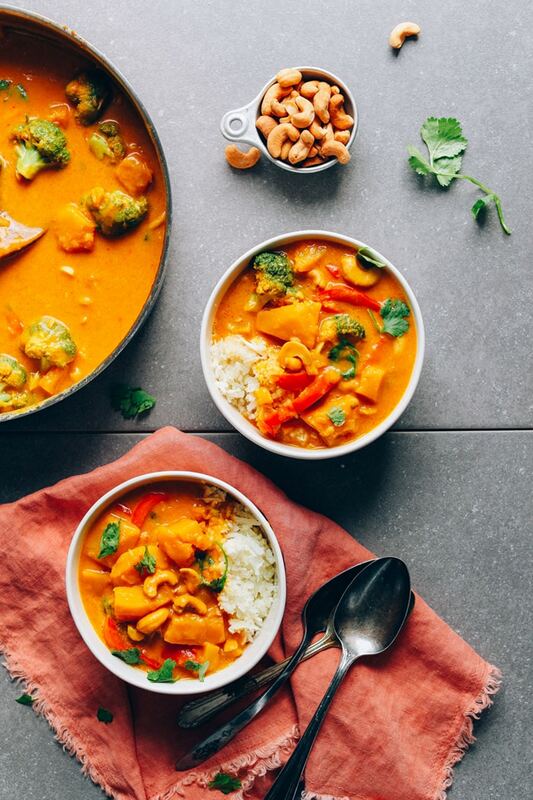 This simple pumpkin curry features pumpkin, coconut, cashews and veggies and is easy to make in one post. This recipe is gluten-free too. This pumpkin soup is very easy to make with just a handful of ingredients and you can go ahead and used canned pumpkin which is great. Aside from that all you’ll need is coconut milk, broth, onion and spices. Gluten-free and can be oil-free by cooking the onion in some water or broth. This beautiful curry has added chickpeas and can be made with canned pumpkin puree for a quick and easy Fall dish. It’s gluten-free, healthy, full of flavour and can be made with everyday basic ingredients. Thanks for gathering all of those wonderful recipes in one convenient spot. My husband loves scones so I will make the pumpkin scones first! Hey Deryn! What an awesome roundup of pumpkin recipes. Thanks for including some of mine. 🙂 Happy Friday! This is a great collection of pumpkin recipes! Is that “Pumpkin Pie Chia Pudding Parfait” I see? I’ll have to run over there and see what that’s about! Thanks so much for posting all these wonderful recipes! I’ll have to get to work. YES! I want to try every single one! Thank you for including my muffins and truffles!!! LOVE IT! Need more vegan pumpkin recipes in our life! THANKS FOR INCLUDING AND SHARING! oh my gosh i LOVE pumpkin! I go through a 15oz of Libby’s a day 🙂 pumpkin oats & pumpkin yogurt mhmm…. on another note, you dont have anything SAVORY on here! I have a pumpkin dish up that I can finally make again up on my blog! Try it 🙂 its indian spiced, with cumin & ginger, and i like to throw in some greens too! I know! I started looking at savoury recipes and I would have ended up with 100 items on this list. I was thinking of a separate list for the savoury ones. I’ll go check out your pumpkin Indian dish, sounds delicious! So many great ideas. This round-up is so well put together. So glad to have found you via Pinterest. Cheers! I’m glad you found me too! Thanks for the comment! 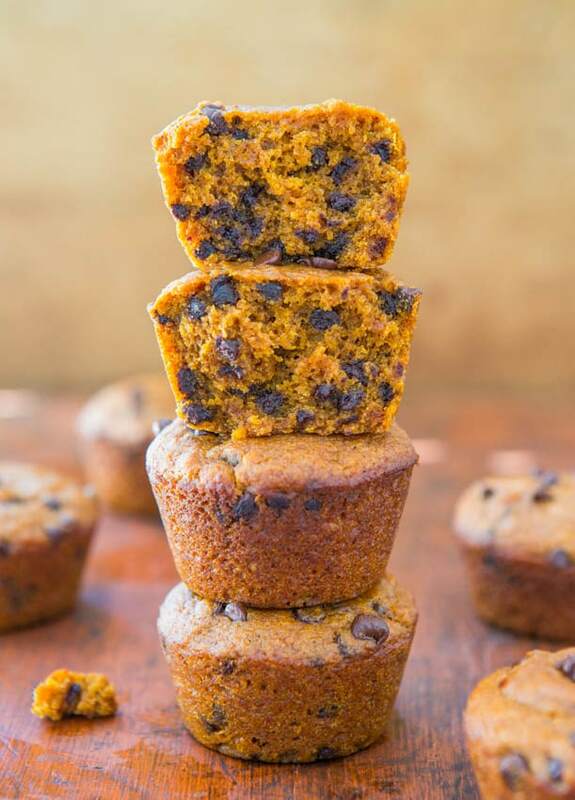 Just what I was looking for- lots of healthy pumpkin dessert recipes. Thanks for taking the time to collect them. Yum!